WOW! What a whirlwind weekend. Shopping until I literally dropped, cooking until I dropped again and then it is over! I enjoyed time with my family and will do it all again.....next YEAR. I think everyone was fed well, and I think the reinvention of my Key Lime Mousse Cheesecake was a hit. I substituted all lime juice and zest in the recipe with orange. Oh man, it was like a dream! I turned a couple of brussel sprout haters into lovers with my recipe and with all that, I will declare the holiday a success! I thought I would spend Monday just vegging but turns out that didn't happen so I thought today I would do that. So far so good. I wanted to use up some leftovers and thought it was a good time to get this blog put up. I know many of you are dealing with leftovers! How many ways can you serve up leftover ham?? Bacon from the brussel sprouts, cheese from the mac and cheese and spaghetti from the night before Easter? I have your answer right here. Make a spaghetti pie aka spaghetti frittata!! This recipe will serve 4 and can be reheated or eaten cold. I often make a frittata of some sort on nights when I make a pot of soup. Something you should keep in mind is that you can use whatever you want for this! I used up some bacon, ham, spaghetti and cheese for this one. You could use veggies of all kinds, spinach, arugula, you name it! So this recipe is just a base, for anything you might want to create in your kitchen with your own leftovers!! Preheat oven to 400. In a bowl whisk together eggs, milk and salt and pepper to taste. Melt butter in the bottom of a medium skillet. Add in bacon and ham. Saute for about 3 minutes. Carefully put your pasta in and spread out evenly over the bacon and ham. Sprinkle cheese over pasta and let cook for 2 minutes on med-lo. Make sure not to really stir, just gently move around so spaghetti stays evenly distributed. Pour over egg mixture, let gently cook for 5 minutes. Using a spatula you can pull the egg away from the side to let more uncooked egg get into the bottom. Sprinkle some green onion on top just before putting in the oven! After 5 minutes put into preheated oven for 5-10 minutes. You will need to keep an eye on it and when it appears the eggs are cooked, remove. Loosen with a spatula, it should be pretty loose already. After it can move freely when the pan is tilted, let sit for 10 minutes. Scoot out on to a serving plate and enjoy! Remember it can be served warm or cold! Try this for breakfast, brunch, lunch OR dinner! With a big pot of soup or with a salad! The meat on the bottom gets crisp and acts almost like a crust, it is delicious! I can't wait to see what YOU come up with to add to your frittata! I too made a citrus cheesecake this Easter. Unfortunately I didn't check on it as closely as I should have and it was in the oven about ten minutes too long. it was still good but a little dry. This fritatta looks beautiful. I love dishes like this. My mousse pie is NO BAKE!! Type "Key Lime" in the search for the recipe!! 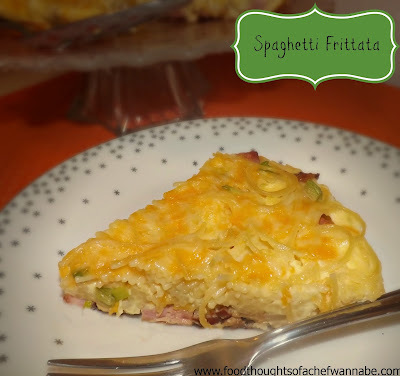 Hope you try the fritatta sometime, I love how you can through any ol' thing in and make it delish!! Thanks for reading!